In previous posts, I covered the 3 main stages of virtualization adoption and the key elements driving the virtualization journey. Just a reminder that most of the material in these posts comes directly from our customers through a primary research project that we carried out last summer. Let’s now double-click on the IT Production phase. In this phase the IT department is the main driver for virtualization in a bottom up type of approach. They virtualize the assets that they own such as file and print servers, domain controllers, web servers, Citrix servers, and so on. Test and Dev servers are also a primary candidate for virtualization at this stage. The confidence is reactive, meaning that the team has enough knowledge and experience to react to certain triggers (see blow for the list of typical triggers) but virtualization is not the predominant computing platform yet. The team knows how to install and operate ESX/ESXi but they are typically not familiar with more advanced features like SRM, DRS, HA and FT. There is a big inflection point in term of confidence when the team learns how to use vMotion as it allows them to perform system maintenance without downtime. It is not unusual to see customers organize internal demos around vMotion to show its power to other divisions and/or to the business. The sponsorship at this stage is typically at the IT manager or IT director level, especially in bigger companies. In smaller companies the CIO has more visibility into most projects going on in his or her org. In many cases, we cannot even talk about sponsorship as much as ownership as IT tends to virtualize what they own first. There are cases where the sponsorship is at the senior level but in many cases the virtualization first policy is not enforced aggressively yet. The predominant value that drives virtualization in this stage is cost saving from servers consolidation. These saves are so significant that they overshadow some of the additional benefits the come from virtualization such as faster provisioning, better manageability, less downtime etc. More on business value further down in this post. Or lack of thereof. Virtualization technology cuts across multiple teams and disciplines: servers, storage, network, and security. Virtualization is typically introduced into IT by the server team without necessarily involving the other teams that will be impacted by the transformation. In many customers this has been the main obstacle to more efficient adoption and in turn value realization. Keep communicating across teams as the transformation takes place over time. We found customers who even re-organized their IT around virtualization to facilitate adoption and optimize their processes. This is somewhat related to the previous point. As much as virtualization has become mainstream in thousands of IT shops and it is running mission critical applications in some of the largest data centers the world over, there are still IT professionals that don’t fully understand how it works and what are its advantages. This is natural with any technology transformation but this FUD does get in the way of wider adoption of virtualization. This is a big hit amongst our customers. They use vMotion to show in a very effective way some of the things that virtualization can do for the business such as disruption-less maintenance, lower risk from hardware failure, and so on. Later in the journey, the vMotion demo is replaced by demos of even more sophisticated features such as High Availability and Fault Tolerance. Virtualization champions within our customers often take the show on the road and they go around the company educating people about the technical and business advantages of virtualization. Sometimes they use a successful internal project that they did, some other times they just hold a virtualization workshop using material from our web site or other blogs. 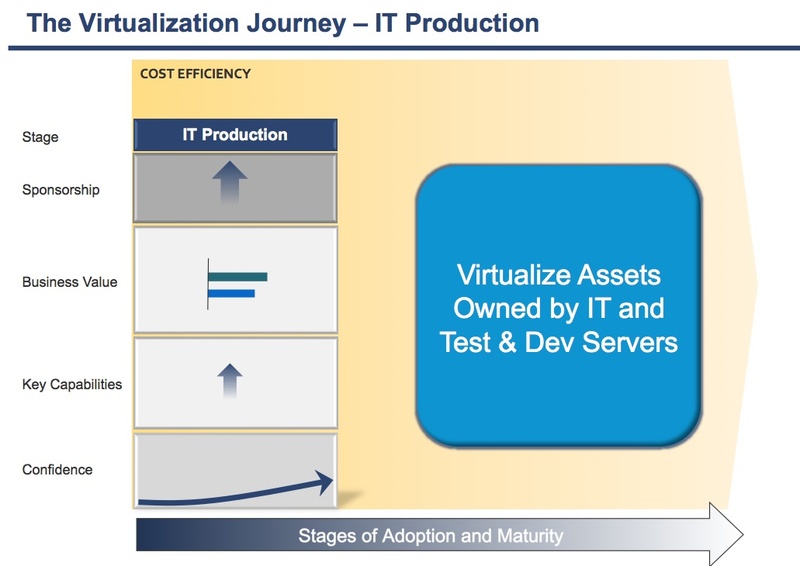 At the beginning of the journey a lot of virtualization happens below the radar as IT virtualizes the assets that they own directly. Later in the journey FUD from application owners and the business side becomes more of a factor and slows down adoption. This is where we found that some of our most confident customers just go ahead and virtualize applications without really telling their business counterparts. I know, this is controversial but true. The attitude of these customers is along these lines: “I don’t let the business tell me how to run my infrastructure. If I decide that virtualization is the right computing platform for a given application, I just do it”. If you think about it, the business does not really care what brand hard drive IT uses right? Overtime the same will be true for whether an application or a database runs physical or virtual. It is indeed true for some customers today where virtualization is the default computing platform. It is a factor of their confidence, credibility and experience. I am not the right person to go deep on this issue. I will look for an expert at VMware and interview him or her about storage best practices in one of the future posts. As covered in this post, we developed a framework to model the relationship between business triggers, VMware product deployed, resulting capabilities and business value realized. Customers respond to these triggers by deploying the basic virtualization platform around ESXi with related management tools (vCenter). Faster provisioning in particular is a capability that fosters more adoption of virtualization and positively impacts the IT team credibility. It is not unusual for customers to cut down their provisioning cycle form weeks to days, sometimes hours. Where the predominant value is Capital saves from consolidations as mentioned above. ﻿﻿This is probably the first area in most customers journeys where the value proposition from virtualization is not predominantly around cost saving from consolidation. There will be many more examples in the following stages (Business production and ITaaS, see this post of an overview). In fact, when deploying products such as vCenter Lab Manager, customers typically realize lower cost for their testing infrastructure, increased application development efficiency and faster time to market for new applications. 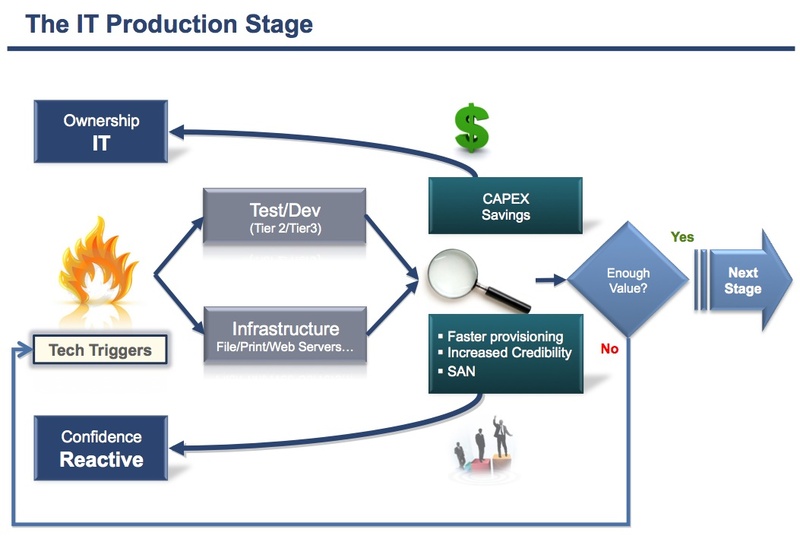 In the next post, I will cover some of the IT Production best practices that we learned from our customers.